“The best designed house in the world” is perfection in my eyes. The symmetrical architecture graced with my favorite Corinthian columns. The mirrors raise to block the windows completely. Obvious where I got my initials from…. Let me know which ones. I know the bedroom was not. Welcome and thank you for your comment. It is so nice to receive feedback. The eigth and tenth picture: The gallery and a drawing room in the Grand Trianon, a building from Jules Hardouin-Mansart and Robert de Cotte, newly decorated by Napoleon's architects. The ninth picture: The Fragonard Room in New York (Frick Collection = the Neo-Louis-XVI-palace for Henry Clay Frick, the US-American industrialist, designed by Carrère & Hastings). 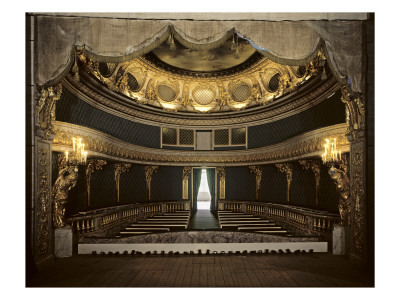 The thirteenth and fourteenth picture: Marie Antoinette's tiny theatre near the Petit Trianon in separate building designed by Richard Mique, her architect, who died on the guillotine in 1794. Thank you so much for your information on these rooms. I enjoy your blog since a few weeks and have to excuse me for my insufficient English (I'm German). Nevertheless it's sufficient to wish you a happy new year, although it's a little bit late. I’ve just come across your blog which I think is marvelous. The Petit Trianon is one of my favourite small classical buildings – it’s perfect to my eyes. I visited there in December after previously visiting 6 years previously. In that time the authority had carried out a great deal of additional work to present the building more fully. I don’t think I would be exaggerating to say that visitors to Versailles need one day for the Palace and one day for grounds and other buildings – it is an extraordinary place.